In this part, you can setup general setting for category. Set background color for global category. Set text color for global category. Turn on this option to show sidebar for global category. Choose sidebar for global category. If you need another sidebar, you can create from WordPress Admin → Appearance → Widgets. Choose title style for global category. Set background color for title of global category. Set background image for title of global category. Please note, this option will appear and work if you choose Style 3 or Style 4 on Category Title Style option. Turn on this option to show hero block on global category. Please note, this option below will appear if this option enabled. Choose hero header layout for global category. Choose hero header style for global category. Set hero margin for global category. Choose date format for hero on global category. Set date format for hero. For more detail about date format, please refer to Developer Codec. Please note, this option will appear and work if you choose Custom Format on Choose Hero Date Format option above. 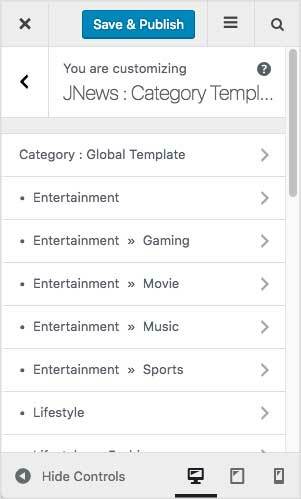 Choose content layout for global category. Set word length of excerpt post content for global category. Choose date format post for global category. Set date format for post content. For more detail about date format, please refer to Developer Codec. Choose pagination mode for global category. Set post limit of auto load when scrolling, set to zero to always load until end of content. Please note, this option will appear and work if you choose Ajax – Auto Scroll Load on Choose Pagination Mode option above. Choose pagination align for global category. Turn on this option to show navigation text for global category. Turn on this option to show page info for global category. In this part, you can override color option of Category Global Setting for each post category that you have. Turn on this option to override global category color. Please note, this option below will appear if this option enabled. Set background color for this category. Set text color for this category. Also, we provide you an ability to override category setting of Category Global Setting. So you can override global category setting for each post category. For more complete information you can follow this link.